In the site-specific installation Shift, the doors are taken away from a former garage of the SBB (the Swiss Railways) few days before its demolition to make space for the advancement of a new building complex. 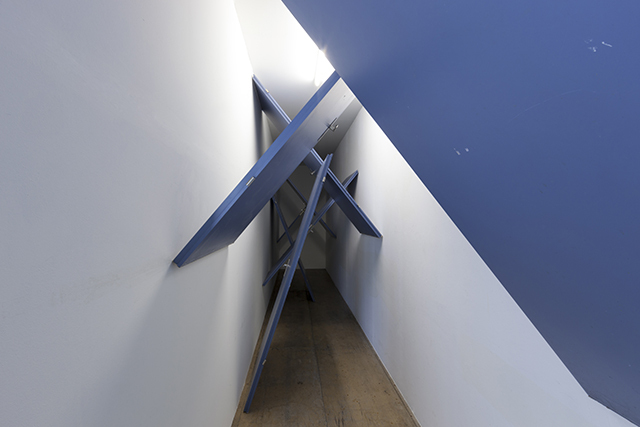 They have been repositioned obliquely to occupy the space, engaging onto the walls of the room-corridor. Shift re-creates a physical confrontation with the surrounding architecture of the exhibition space. The architectural elements impose themselves to the space as well as to those who cross it, trigging a short circuit between obstructing and going through.